Like it or not, we have reached a point in the social, cultural, intellectual and artistic history where we are all going to be affected by politics. We can no longer ignore it. It threatens our daily lives and our daily happinesses. The new political movements we feel all around us can no longer be left at the periphery of the artistic consciousness. Our black population and our student population have finally declared themselves sick and tired of desolation row and finished with the old folks home at the college. The blacks and the students are our brothers and they are doing something which we must take awareness of. And we must participate in it because they are fighting a fight against our enemies, even if our participation is just by the fact of awareness itself. These new politics are about to become a part of our daily lives and willingly or not, we are in it. The fact that Wenner claims “The blacks and the students are our brothers” and not his intended audience is telling. Oh, Jann! Gotta love his idea of participation in the fight “just by the fact of awareness itself.” Yeah, I’m sure the kids getting their heads bashed in by the cops really appreciated your awareness, pal. Do-gooder Baby Boomers, unwilling to really get involved, but hey, at least they’re aware of the struggle! 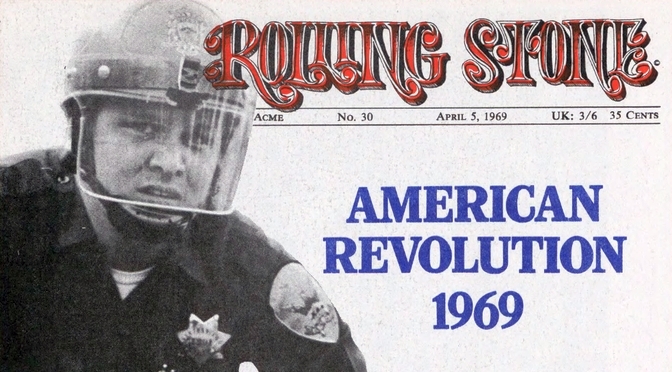 This issue also features the debut Rolling Stone review by Lester Bangs! News: “The Doors: ‘Uh-Oh, I Think I Exposed Myself Out There'” by John Burks; “Blood Sweat and Tears: ‘We’re the World’s Ugliest Band'” by Paul Nelson; “Mamas and Papas Do It Again”; “Musical Chairs For Jeff Beck”; “Noel Redding’s Fat Mattress”; “Baker and Big Pink Sign for Western” by Jerry Hopkins; “Monterey Festival: $37,000 Settlement”; “Celestial Synapse At the Fillmore”; “Crosby-Stills-Nash Wind Up Album” by Jerry Hopkins; “Elmira” by Richard Brautigan; “The Small Faces Call It Splits”; “Creedence C’water At the Hop” by Ben Fong-Torres; “‘Rockumentary’ Radio Milestone” by Jerry Hopkins; “Big Pink Band To Tour U.S.”; Random Notes on Johnny Cash, Traffic, George Harrison, the Monkees, Jimi Hendrix, Ringo Starr, Sam and Dave, and Frank Zappa. Columns: Perspectives by Ralph J. Gleason (“Is There a Death Wish in U.S.?”) and Books by John Grissim, Jr. (on Dear Doctor, Hip Pocrates: Advice Your Family Doctor Never Gave You by Eugene Schoenfeld, M.D.). Full-page ads: Van Morrison’s Astral Weeks on Warner Bros; Near the Beginning by Vanilla Fudge on Atco; Jethro Tull on Reprise; Muntz Stereo-Pak cartridges (2-page spread); Steppenwolf At Your Birthday Party on Dunhill; Happy Trails by Quicksilver Messenger Service on Capitol; Kick Out the Jams by the MC5 on Elektra; Baldwin Exterminator amplifiers. More ads: Moby Grape 69 on Columbia; Tons of Sobs by Free on Island; Linda Ronstadt’s Hand Sown…Home Grown on Capitol; The Poetry of Rock by Richard Goldstein (Bantam Books); Ovation Instruments; The New Electric Circus; Electro-Harmonix Power Booster; My Griffin Is Gone by Hoyt Axton on Columbia; John Mayall on London; The Early Bird Cafe by the Serfs on Capitol; The Last Ritual on Capitol; Ars Longa Vita Brevis by the Nice on Immediate; Eddie Harris’ Silver Cycles on Atlantic; Observations in Time by the Ohio Players on Capitol. 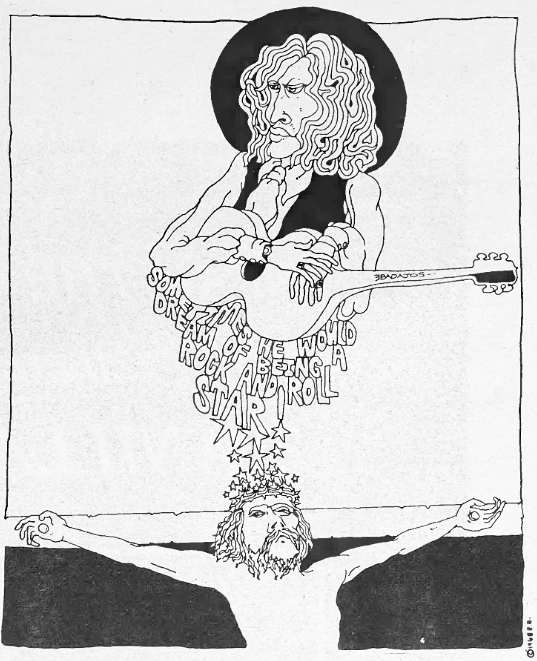 Reviews: Dr. Byrds and Mr. Hyde, the Byrds (by Jon Landau); Moby Grape ’69 (by Alec Dubro); Cleanliness and Godliness Skiffle Band’s Greatest Hits (by Gary Von Tersch); Kick Out the Jams, MC-5 (by Lester Bangs); Neil Young (by Gary Von Tersch); Nashville Airplane, Flatt and Scruggs (by Tom Diemer); Guitar Sounds from Lenny Breau (by John Burks); Lenny Bruce: The Berkeley Concert (by Ronald Hayes); Goodbye, Cream (by Ray Rezos). Subscription offer: New subscribers could get a free copy of Ike and Tina Turner’s River Deep – Mountain High (with 50 cents for shipping and handling). $6 for 26 issues; $10 for 52. Previously: Issue 2, 4, 5, 6, 7, 8, 9, 10, 11, 12, 13, 14, 15, 16, 17, 18, 19, 20, 21, 22, 23, 24, 25, 26, 27, 28, 29.